We live in a rapidly changing world and at Victoria University (VU) Online, we’re constantly innovating to meet the evolving needs of our growing community of students. After more than 100 years delivering courses that cater to the career aspirations of students from all walks of life, VU Online is uniquely positioned to develop learning and teaching models that suit today’s students – both undergraduate and postgraduate. In 2018, VU delivered an Australian-first with the introduction of its innovative block study teaching model. Offered initially to first-year undergraduate students, the block model of study is described by Vice-Chancellor Professor Peter Dawkins as “one of the biggest student-centred, staff-led and community-integrated transformation programs ever undertaken in higher education in Australia”. It aims to reduce the stress of university study by completing subjects in ‘blocks’ rather than all at once. VU's innovative First-Year block model: explained. 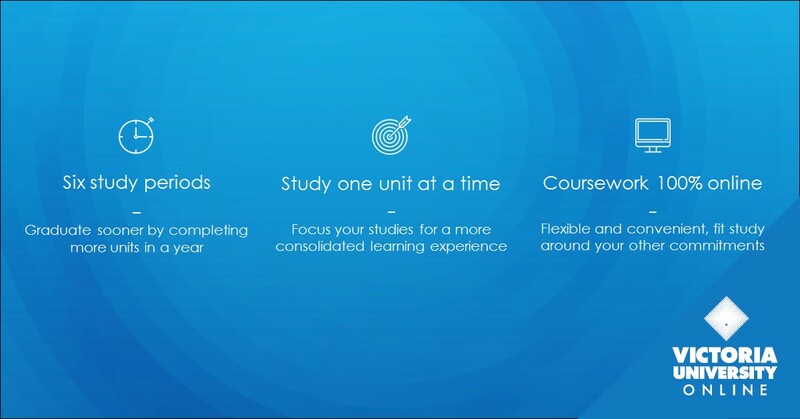 While traditional university courses require students to manage the demands and deadlines of multiple units of study all at the same time, VU’s ground-breaking block model enables undergraduate students to focus on one unit at a time. The block study model removes a lot of the stress out of completing tertiary study because students complete all their assessments in one subject before moving onto the next. A more focused learning experience, VU students have enthusiastically praised the university’s new block study model. “If I was to do four subjects at a time, and four assignments at a time, I’d be having a lot of coffee-fuelled nights and coffee-fuelled days trying to get it all done … it’s a lot less stressful doing just one subject at a time rather than four at once,” says education student, Liam Mulcahy. Sport and exercise science student, Declan O’Brien, also finds not having to manage content and assignments in multiple subjects at once a bonus. “There's one class to focus on so you can really commit to that class and you can do your assigned homework or your assignments in a way that suits you,” says Declan. As well as improved pass rates, the benefits of the block study model for undergraduate students include the opportunity to accelerate learning and graduate earlier or slow down learning because of other life events. These benefits of block mode teaching have been extended to VU’s postgraduate students via online courses including VU Online’s Master of Business Administration. VU Online offers postgraduate students an innovative ‘six-study-period per year’ model. This means you can finish your degree faster by completing units more quickly than many traditional part-time postgraduate courses. At the same time, you can slow your study down at any time you wish to meet the demands of work or family. VU Online’s intuitive online learning platform, VU Collaborate, makes postgraduate study incredibly accessible. Resources, coursework, assignments and student support are available 24/7 via VU Collaborate. Whether you fit study in around work, children or other priorities, you can still achieve your dream of earning a higher degree with VU Online. According to Professor Dawkins, VU’s constant reimagining of course delivery is driven by an overarching commitment to driving better student outcomes. “We are constantly rethinking the University experience through a student lens,” Professor Dawkins says.